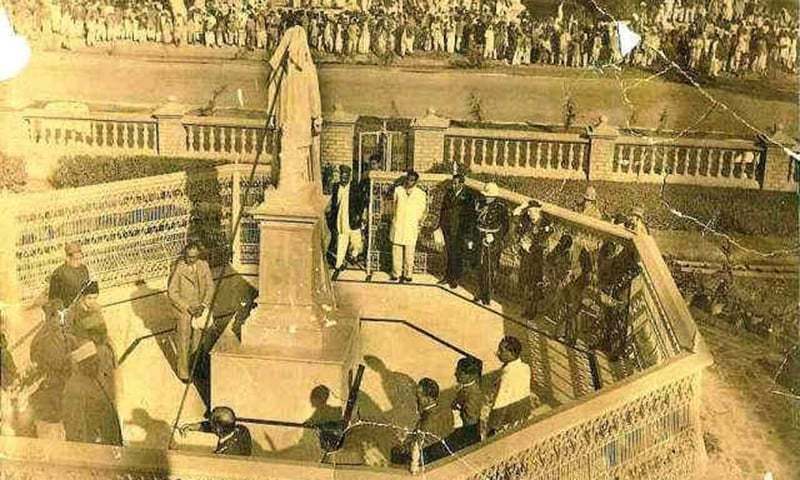 In 1980, a curious new statue appeared in a courtyard in Sindh University: the statue of Udhaw Das, who started the Udhaw Das Hospital in Shikarpur. The sculpture shows signs of damage, and Das’ carved nose and ears have an orange crack running through their skin. But Das’ presence is no less imposing: his serious, heavy eyes gaze at the viewer with casual intensity. The sculptor has dressed him in a long, collared tunic, paired with a loose shalwar. In one hand, he holds a document — the certificate he got when he was awarded the title of Rai Bahadur — and the other hand is missing. What was it that drove people to deface Das’ statue, not once, but multiple times? 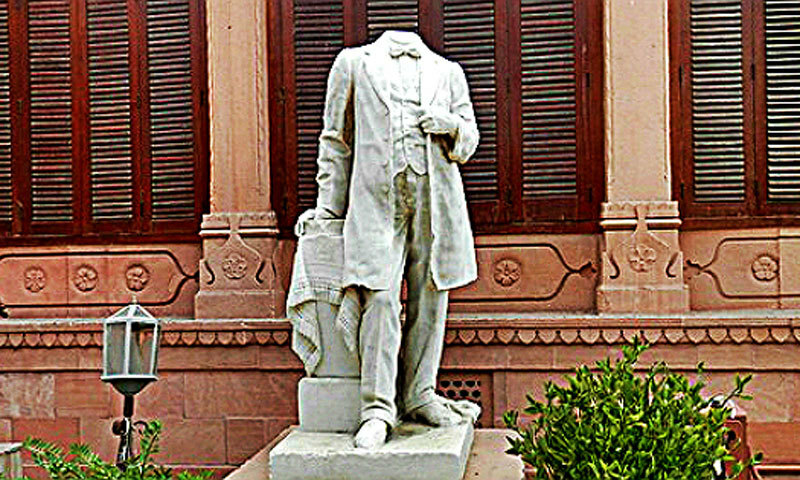 The statue vanished at some point in the late 80s only to reappear in the Sindh University’s Sindhology department. Who was this strange man and why was his violent beheading — which is likely to create the impression that a Hindu was targeted by communal violence — not directed to his person, but to his statue? 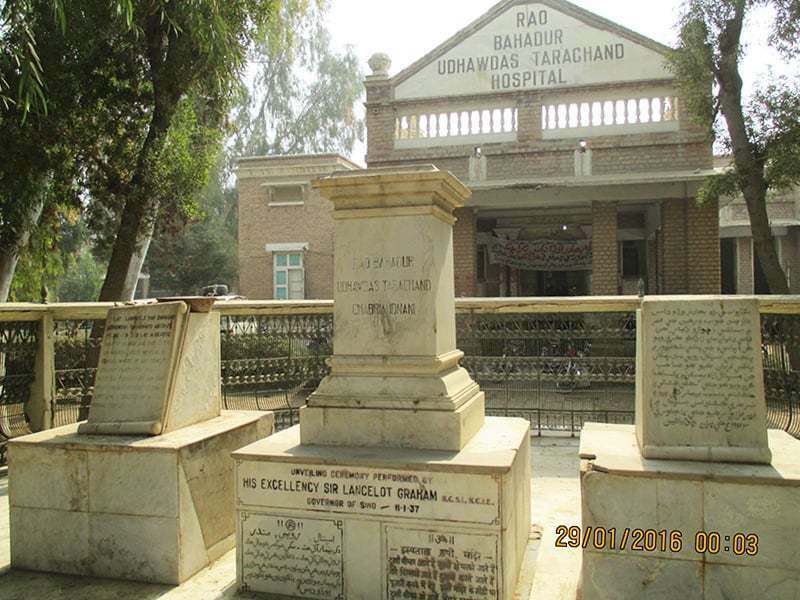 Rai Bahadur Udhaw was a renowned trader from Shikarpur, where he founded a hospital before partition. A trader-turned-philanthropist, Das was devastated when his mother fell ill. At that time, Shikarpur lacked a hospital, and Das was spurred to do something about it. His endeavour was undertaken during a time of political turmoil. 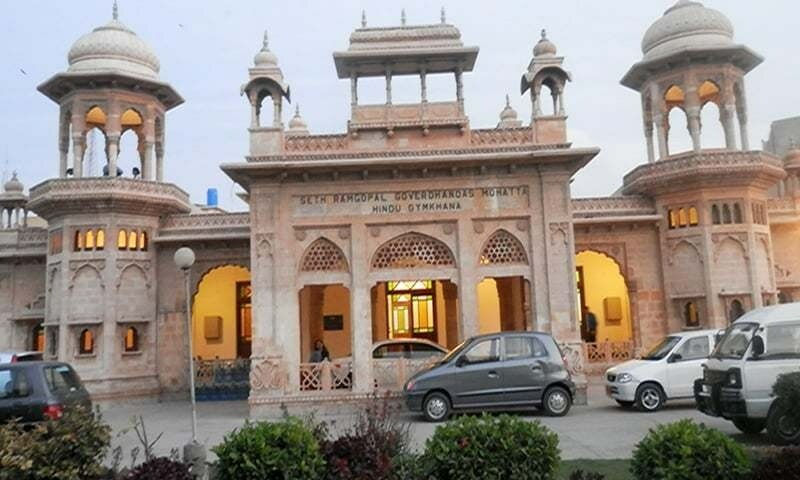 On the one hand, the entire sub-continent was embroiled in the politics of partition, while on the other, he faced severe difficulties in securing funds for running this hospital. In the end, he personally provided 100,000 rupees for the construction — a hefty amount for the time. 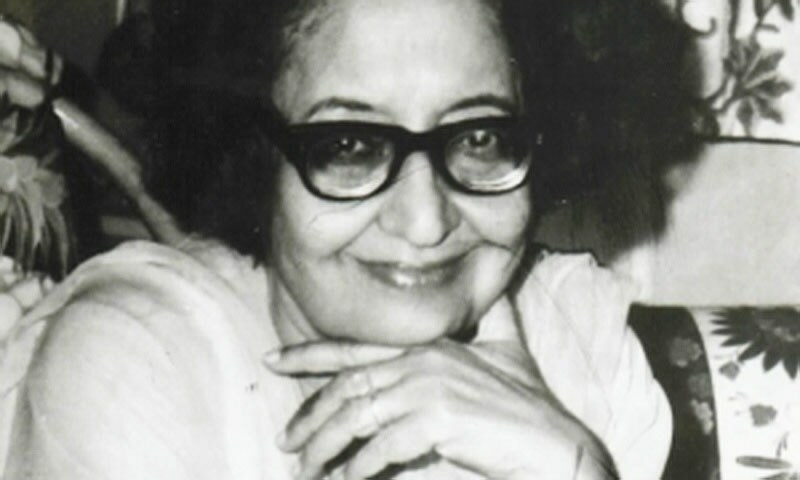 Seeing Das’ efforts, some charitable Muslim personalities of the time were inspired to contribute their own bits, although their contributions were far less than those of the Hindus who took part in the project. 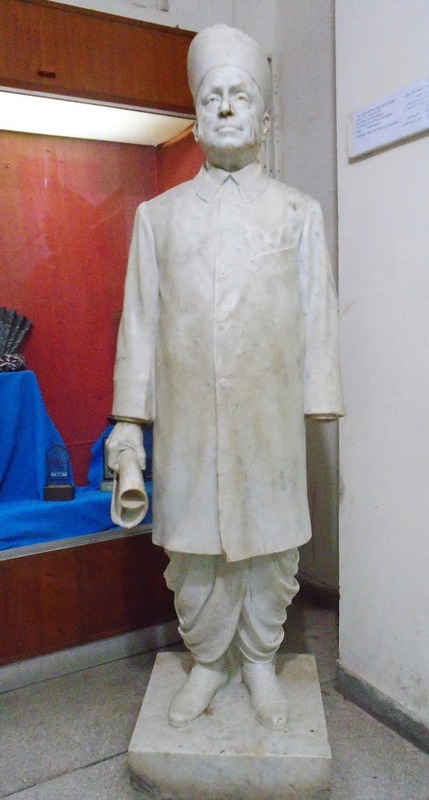 The statue first found its way to Sindh University during a certain Dr Ghulam Ali Alana’s tenure. “I got a call from someone in Shikarpur 1980 or 81,” Alana recalls. He can’t remember the exact name, but the man said he belonged to the Agha caste. He told Alana that a mob, comprising activists from Jamaat-i-Islami, had attacked Udhaw Das’ statue, torn off its limbs, and 'beheaded' it. Alana was then asked to shift the statue to the university, and help restore it to its original form. It wasn’t the first time Das’ statue had sustained attacks. After partition, many had attempted to ruin it, particularly by trimming his nose and ears. The final attack in 1979 by JI was triggered by a rally. According to Shikarpur-based journalist Zahid Nun, participants of the rally were carrying various iron tools. The mob stormed the statue and only backed off after it was deseated from its pedestal, and crashed to the ground. Once the statue was shifted to the Sindhology Department, Alana says he was worried it might be attacked again. 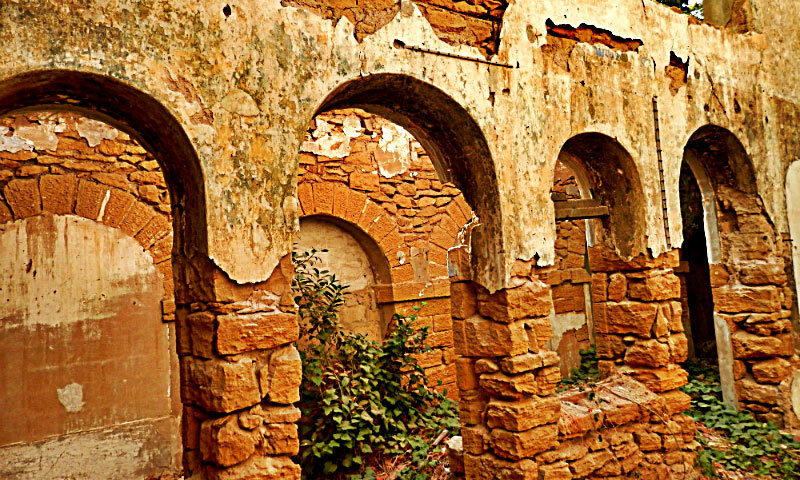 To hide it from plain view, he covered it up and placed it behind a door inside the Roshan Shah Rashidi Museum. “Whenever a function was held at the museum, we took extraordinary precautionary measures, making sure that no one got near the statue,” he remembers. But Alana knew the streak of luck would not last. In 1980, the museum was visited by prominent jurist A.K. Brohi, a close aide of Gen Ziaul Haq. Alana accompanied him on a tour of the museum, trying his best to keep the statue hidden, but the shroud-covered sculpture immediately drew Brohi’s attention. Alana told Brohi he feared the reaction of religious zealots, but Brohi was insistent. No matter what, he wanted to see it for himself. 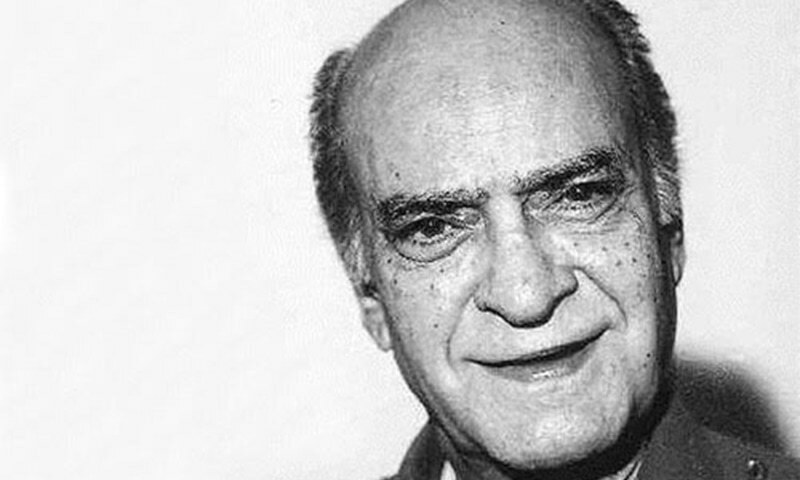 Das’ sentiment was simple: he was driven by humanism and the well-being of other humans. 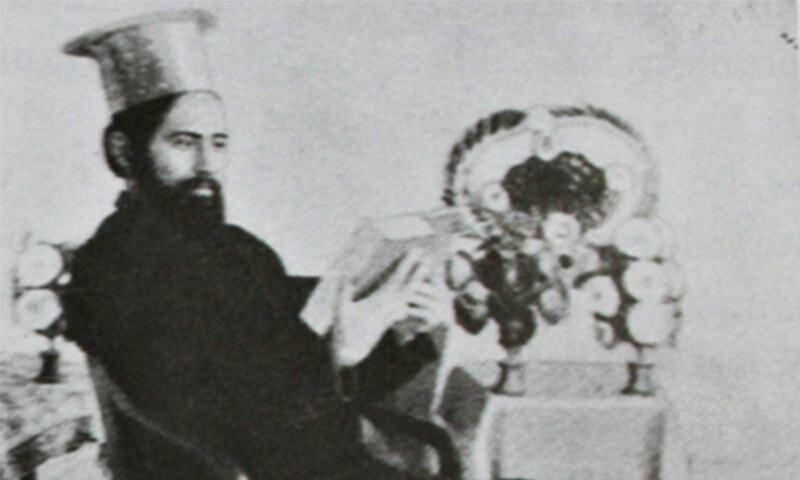 Renowned scholar Anwar Figar believes Das was so driven by his commitment to others, that he sacrificed everything after setting the hospital's foundation stone on April 30, 1933. Since funding was a constant issue, Das made his way to Bombay (present-day Mumbai) to continue collecting donations for his hospital. During his stay there, he fell sick and died. Ironically, the hospital he passed away in is attributed to another social worker, a like-minded humanitarian soul. Late Rai Bahadur Udhaw Das Tara Chand, 73, passed away from this physical realm. [Udhaw Das], personifying sacrifice, surrendered his soul for the hospital which he cherished like a temple. This generous soul had gone to Bombay for collecting donations, where he got ill because of his incessant efforts. He was shifted to Sir Hari Kishan Hospital for treatment, where he breathed his last on January 17, 1943. After Brohi’s generous declaration, the job of restoring Das’ statue was handed to Azeem Chandio and Ali Nawaz Phulpoto. Chandio himself had travelled to Shikarpur to procure the statue, a journey that was marred with difficulty and a lack of cooperation. When he reached the hospital, he remembers failing to secure any information. He asked people to tell him where the ‘conquered’ state was kept, but no one was willing to help him out. He went from one department to the next, ending up in the office of the municipal committee. Here, he noticed that employees were trying to bar his way to a certain section of the premises. Upon insistence, he was finally accompanied to the place — albeit reluctantly — but to his disappointment, he found nothing. Then he noticed a door which was being treated with similar secrecy. When he inquired further, he was told it contains only ‘useless scrap’. Unconvinced, Chandio asked them to let him in. Inside the room he found not one, but two statues (the author will dwell upon the story of the second statue in a future blog post). Both statues were in terrible shape; they were defaced and mutilated, and shared one common feature: both were missing ears and noses, and their faces were painted black. 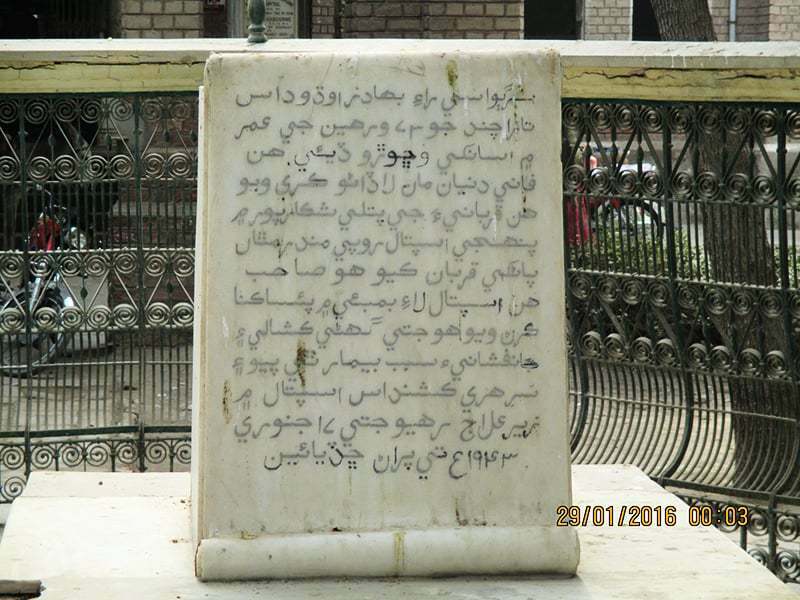 Back in Jamshoro, Chandio was determined to restore the statue at all costs. He meticulously began measuring the sculpture, from its various lengths, to the details of pieces broken off from it. He then used a chemical to remove tar and paint off the statue’s face. Restoration started once it was cleaned up, and Chandio faced the greatest difficulty in re-fixing Das’ nose and ears, which he says had been chopped off with a vengeance. The statue today is a triumph of Chandio’s patience and efforts, but when he worked on it, Das’ arm was missing just one finger. Chandio is baffled by the missing hand; he does not know when it was removed from the statue. I believe Udhaw Das was a conscientious and intelligent man, who somehow foretold what would befall his statue. He figured out a way to evade the vagaries of time and whims of man. 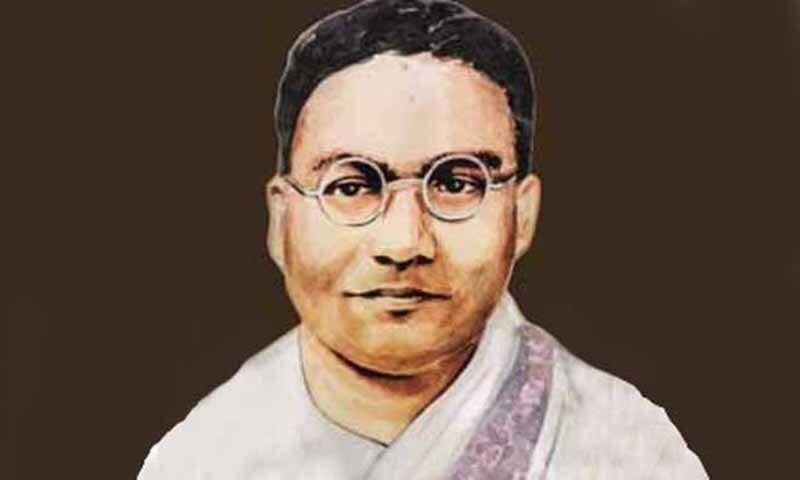 All those who visit the hospital are not even aware that on the steps of the hospital’s entrance, they are treading upon Rai Bahadur Udhaw Das’ name — this was not damaged in any way by the mob of zealots who attacked and defaced and mutilated his statue. 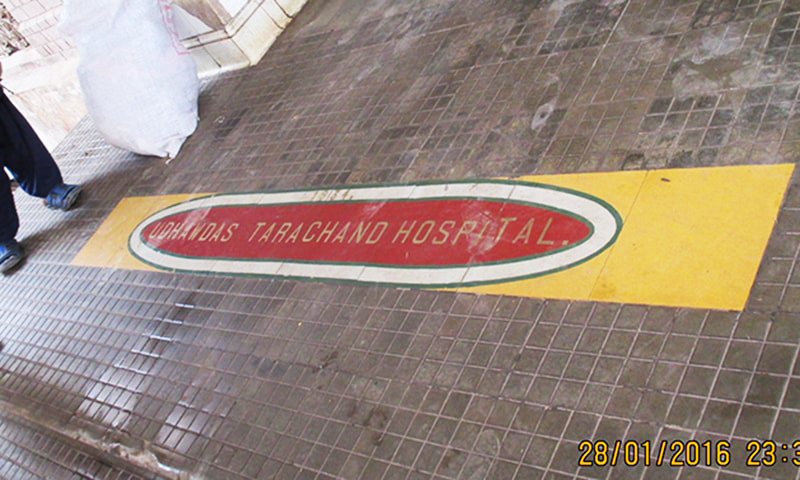 In a sense, Udhaw Das is fulfilling his wish: everyone who frequents this hospital treads on his name on the steps of this hospital. And despite attempts at erasing Das’ name and contributions, both his statue and his legacy continue to survive. Dr Alana remembers the time he was visited by Sindh’s minister for health, Ahad Yusuf, who was seeking advice. Yusuf told Alana that religious organisations were pressing him to rename the Udhaw Das Hospital. Yusuf simply rose up and went away without responding to Alana’s emotional outburst. Alana says he doesn’t know if his words had any effect on the former, but the hospital’s re-naming was never authorised. Translated by Ghouse Mohiuddin in English from the original in Urdu here. If a similar incident happened to a Muslim figure else where in world there will be so many people vowing to avenge. We should atleast have respect for those who gave us something good. So much hatred for Hindus from the very people whose forefathers were all Hindus??? Rahejas, hindujas, and many rich hindu traders of shikarpur left pakistan for india as they saw no future in pakistan, it is clearly loss to pakistan as all sindhis in india are well off and they have build many premier hospitals school and colleges. Akhtar Baloch is a great researcher and restorer of true history. He has written articles that make the past come alive. He should be given the honor accorded to people spreading true knowledge. Our Non Islamic heritage is a fact. It needs to be given prominence, accepted and the truth taught at schools and colleges. All the charitable medicals in the sub-continent was built by Hindus, except few missionary run hospitals . Muslims being the forced-converts from lower section of society remain uneducated and behave like animals , though exceptions are always there . Bad and foul ideology from Arabian deserts invaded Indian subcontinent and forms today's subcontinent. It is your country. You are free to keep or destroy what ever you like. Religious extremists especially muslims have no respect for Hindus either they have done any humanism effort or job for society. Thank you for sharing this brilliant story of such a brilliant person. True religion is all about humanity and humanity is above anything else. Sir your legacy will live, maybe not in the form of a statue but definitely as respect and gratitude that I (after reading this article) and many others have for you for the ages to come. Brilliant article - i never knew about this great man. Thank you for enlightening me. As per my understanding if you don't respect your forefathers then you would be also lost one day. Akhtar Balouch is back after a long time but with a bang! Sir, Respect ! For bringing this sad story to light. Shame on all cavemen who tried to destroy a great man's legacy. His only fault is that he is a hindu and chooses to worship god differently. That justifies this behaviour towards him. A true humanitarian. In 1973 this hospital probably saved my life when I was taken there after a snake bite because snake venom injection was only available there throughout the district. 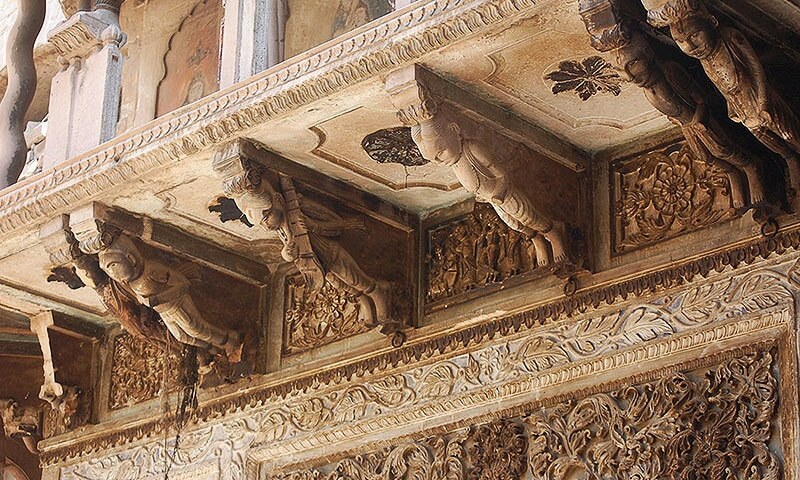 Soon after I met and witnessed the keen interest of Dr. Alana, then a minister, when he was touring the city and trying to preserve the intricate woodwork heritage of the Havelis of the city. Wish to contribute funds towards the preservation of this statue. Brilliant Balouch Sahab. 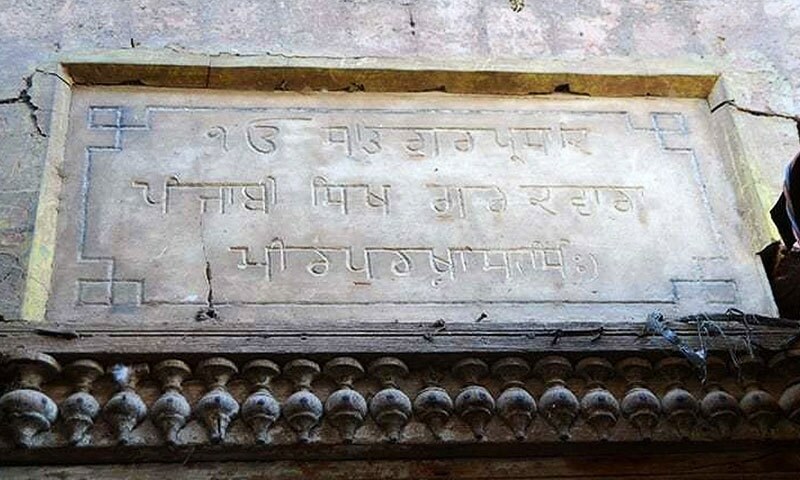 Do write if you can about the Marwari Businessman Shivratan Mohata who built the famous Mohatta Palace in Karachi? I believe he was a fascinating character also. He looks like our Subramaniam Swamy reincarnated, now i beleive in reincarnation. The hatred for Hindus has cost Pakistan more than it can afford. Imagine the pain this guy would have felt if knew what was going to happen in the future. I bet he would have still made that hospital though. good thing is that its in Sindh. if it was Pakistani Punjab his stature probably would have been crushed with hammers long time ago. Dear Baloch - You are Great ! What a sad state of affairs in Pakistan! Respect your own history to respect yourself. Omg Pakistanis don't care about the people who have given them institutions. In this way harappa and other things should also be non-pakistani? A country ruled by fanatic bigots is bound to be doomed. Minorities are treated far worse than animals, says enough about Islamic foundations. If you treat even great persons as shabbily as you did, bright future awaits you as a country! Who are these people that have no respect for their own history, their selfless heroes and the benefactors of their elders? Thank you sir Akhtar Balouch for highlighting this. If we can't honor such human being, then we are not worth being called a human either! @Sarah1 This is not the end of the story. This mind set is alive and thriving- in the form of degradation of Dr Abdus Salam's grave or in the treatment given to Malala. Mr Akhtar Balouch is a true hero of Pakistan, bringing to the public true stories from history, that can only inspire. With human behavior turning cruel and psychotic, stories of heroism and sacrifice can be a great motivator. Salutes from across the border. I must also pay respects and congratulate the translator Mr Ghouse Mohiuddin , his dedication and sincerity has helped capture the true essence with all its emotions. Those who believe in humanity above all else, are divine children of the Almighty. God Bless ! A decade later Taliban destroyed Buddha in Bamiyan. I did not even know once there was a sculpture of this Great man there at RBUT Hospital. Even though I dwell in here Shikarpur. Salute to his Majesty, for his Incessant efforts to this Hospital. @Salman (Kashmir, INDIA) That is the reason for hatred. @mimi sur I like the way you summed it up. Good comment. We should understand that if we are not able to change our bad habits then the reason is ... we are not ready to accept that our habits are bad. Thank you Akhtar Balouch for bring this story. I hope you will continue to educate us. Karachi probably has large number of such stories. Sindhis are more tolerant than other part of Pakistan. I have seen no society that is more eager to erase, collectively and summarily, all memory of its rich history, cultural heritage and benefactors. What hope can be there in the present or in the future for Pakistan as a nation? Why everything needs to be looked from the prism of religion? I hope in Pakistan hospitals do not treat patients on the basis of religion. We in India are proud of our historical achievements, whosoever has contributed to history whether good or bad is taught in school history. History in India is history, no prominence is given to contributions of people from any particular religion, all are treated equally. Thank you Dawn... Great article. Bringing great culture and people to the front. Really very sad state of affairs..
very informative piece. thanks Dawn. God bless u for such a good article. But it made a painful reading. Balouch Sahab brilliant article I got enlightened and after going through the comments of the readers it gave me solace that so many rational thinking readers of The Dawn is there. @Salman (Kashmir, INDIA) Stop generalizing the whole population because of few. The illeterates have gut while the literate knows are afraid. @vicky Yes, in the whole subcontinent. Saddening but even in India where minorities are not treated well. It's show narrow mind pakistani majority who always blamed indian majority.We always likes and respect humanity ,religions and art heritage and feel proud compared to You. Felt very sad to read the fate of statue of late Rai Bahadur Udhaw Das Tara Chand, who was a true humanitarian and brilliant philanthropist, which was treated like this by the mob of illiterates, which was orchestrate religious bigots. This is the hight of intolarance to a kind person who was benefactor to the poor and rich as well, by building a charitable hospital. Thanks Akhtar Balouch for the article as usual. The truth is ,true religion is all about humanity and humanity is above anything else. Even statue of minorities are not safe in Pakistan . Shikarpur - land of my father. What a sad way to treat the legacy of those that only wished well for others. I request zara hat key team discuss this like issuue more often by which people can be educated. Sometimes i use to see their discussion. Their subject of discussion is more analytical but some times they avoid to naildown the real culprits of events. Perhaps they fear backlash from their audiance. 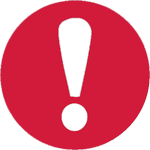 Some of their disscussion on intenational afaires are premature and not substantial. Anyway good. Sad. What is the country but the common people whom live in it? If this person built a hospital for the common people, isn't he doing it for the country? I am glad this happened after he passed away, although he may have done these good deeds only for the sake of the good deeds. If all of us believe Humanity is only religion we all can live peacefully. Every religion has fanatics we should ignore them once & all. @Salman (Kashmir, INDIA) Lol! you sound like one and certainly speak for yourself. BTW in defense of those whose forefathers were hindus, you talk like a child and make no sense when you mention forefathers in context with religion. Only a non-muslim would talk like that. Thank you Mr. Baloch for putting valuable effort in researching and presenting such a heart touching history of the continent. I appreciate the focus kept on the subject person in Udhawji without making much publicity of JI. @Hamid shaft : Though it is hidden from the easy reach of fanatics! @The Right Left ; Not all cavemen! Some of them were great artists of their time and its iOS only through their steady progress , we have arrived where we are . Sadly, SOME ignorant partisans are still with us! @Yogi Vinayak ; Try harder! Great article ! Wonderful narration. I hope Dawn can promote goodwill between Hindus and Muslims and friendship between India and Pakisthan . @Indian you are totally right. God Bless you for this wonderful article. Humanity is the greatest thing. Respect him apart from any classification. My hearty respects to the writer, as well as Dawn for publishing it. @Desi Gal you are right bt isn't bad it vice versa!! Great and enlightening article. Salute to u sir. @jatin, Sir Syed Ahmed, although a Muslim, he established Aligar School/University for all. No, No it is not possible that a non-Muslim can be 'trader-turned-philanthropist' least of all in the land of the Pure. @Salman (Kashmir, INDIA) If everyone has this feeling in India and Pakistan, both the countries would prosper. @Rashid Sultan I commend you for your very nice post. @Ali Asghar , Very well said. Every body should rise above the religious cloud, and see that we are only human beings having feelings, emotions. There is no room for statues in Islam and an Islamic country , so crushing this one is no different. As far as the person Udhaw Das is concerned, he was a noble person so all respect goes out to him!! peace out. Akhtar Bhai, I can just say the words from Sanjay Dutt's Movie -Roolay kya Akhtar Bhai. Your articles have always filled me with nostalgia that my parents and grandparents had about their days in Laiya (district Muzzafargarh) before partition. I always get inspired by your honest quest to give the modern generations a glimpse of our cherished past. I am strong believer of Indus Valley Civilization and oneness of humanity. thanks brother. Keep it up. Million gratitudes. @mimi sur , Strong words brother, but true to a greater extent. How I wish even Hindus can be educated to know the difference between Dharma and Religion so that they (majority) do not fall into the downside trap that Religions cleverly set and Hindus fell for it. @Indian , true, very true. This reminds me of a story that manto wrote. The statue of ganga ram. In his story "Garland" based on a true incident on the frenzy of religious riots of 1947, an inflamed mob in Lahore, after attacking a residential area, turned to attacking the statue of Sir Ganga Ram, the great Hindu philanthropist of Lahore. They first pelted the statue with stones; then smothered its face with coal tar. Then a man made a garland of old shoes climbed up to put it round the neck of the statue. The police arrived and opened fire. Among the injured were the fellow with the garland of old shoes. As he fell, the mob shouted: “Let us rush him to Sir Ganga Ram Hospital” forgetting that ironically they were trying to obliterate the memory of the very person who had founded the hospital where the person was to be taken for saving his life. The author uses the word humanism when, perhaps, he means humanitarianism. There is a difference! I am proud ( & will always be) of doing 4 years of my undergrad school at Dayamal Jetharam (DJ) Science College, Karachi ! Very informative article..i wish some one can behead the intolerance, bigotry, backwardness, and religious retardation that is so deeply ingrowned in to Pakistani society. @Javed you mean two wrongs makes one right? once some one does not have any qualms in getting medical treatment in this hospital, then why should the name bother them. instead of renaming it they should build another hospital to their favorite name. Time keenly awaits the day when sensible people in Pakistan prevail upon the fanatic zealots for a better and peaceful future of mankind. 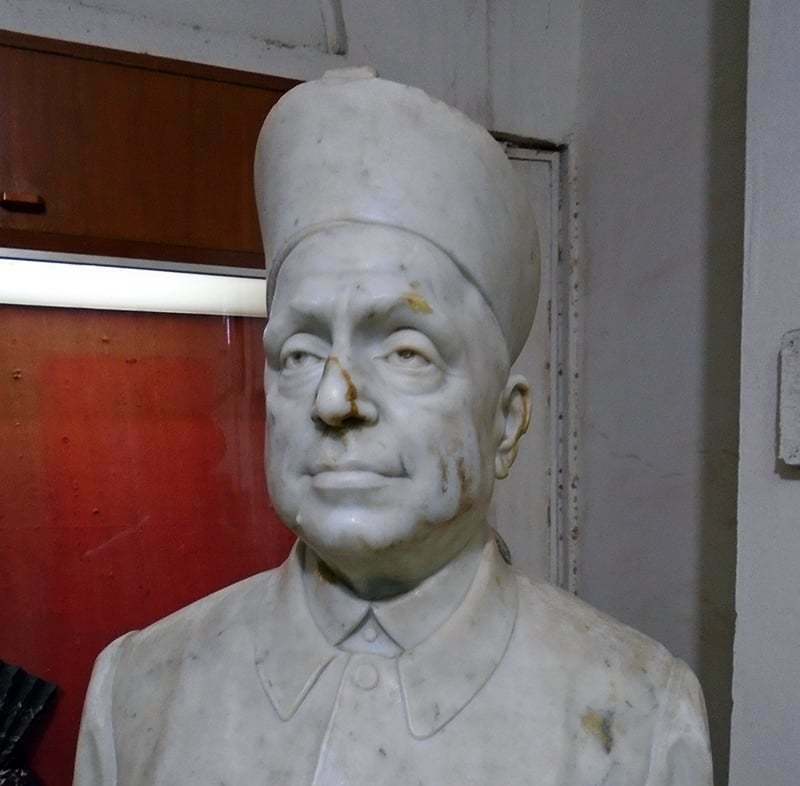 @Ammar I suppose that before the police came, nobody pointed out to the mob the fact that the hospital was named after the same man whose statue they were defacing. It might have even been dangerous to make such a revelation. Hinduism, means humanity, humanity to words all living things.I am proud of my religion' s basics. It is the oldest.It greatly served the mankind.,regardless of its place and colours. 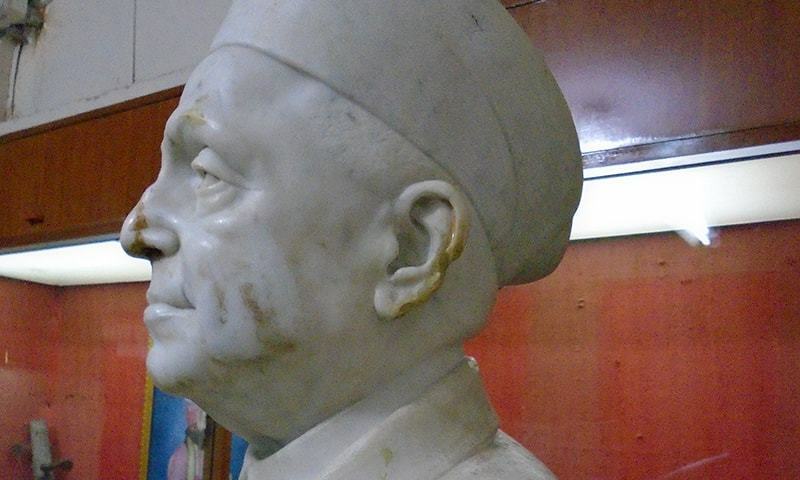 Demolition of Udhavs Das's statue has nothing to do with his religion. In Islam, idol worship is banned and hence it was demolished. If JI had left the statue standing, then illiterate people would have started idol worship which is undesirable. Heart aching story. This great man did what 99.99% of people don't do for others. He sacrificed so much for humanity and religious zealots din't spare even his statue. There are people's and then there are angels, it takes sacrifices to rise to that level. Just think about the bent of mind and thoughts of the people who beheaded his statue. Ignorance, stupidity, madness or less human all of these words fall short....Religions are made for people, not vice versa. Human life is beyond religion. Love and peace from India. @Akhtar Balouch - Love your articles sir! Good work. This probably has nothing to do with the the person being a Hindu, a vast majority of Pakistanis think that there should be no display of any statue in a public place. That is why we do not see statues of such luminaries as the Quaid-e-Azam, Allama Iqbal, or Liaquat Ali Khan. @Salman (Kashmir, INDIA) I don't hate Hindus, neither do any of my friends...some zealots probably do (5%) but they have never been voted into power and never will be! Unlike in your country I might add. You do not have to put statue, a nice metal inscription or marble inscription with complete story in memory is excellent way to honor any event or person, used all the times in US for thousands of memories or events of past. Statues be kept for someone of great stature like Quaid a Azam who himself never preferred any statue or publicity but his memory will always be in heart and mild of every one in Pakistan.